The digital revolution has brought with it a host of advanced new apps for pilots. While aviation technology is unlikely to replace the skills and expertise of human pilots any time soon, these navigation and data logging apps are certainly doing much to make their lives easier. Having been downloaded over 30m times, MyRadar is one of the most popular weather apps on the market. Built specifically for aviation, this intuitively-designed app can perform functions like tracking IFR flights and their ATC-assigned flight paths, as well as showing how weather could affect the flight. Dubbed “The Facebook of Aviation” by Wall Street Journal, Flightradar24 Flight Tracker instantly puts huge amounts of data at pilots’ fingertips. Using this app, pilots can view the current position of aircraft in real-time anywhere in the world, as well as the associated flight information. 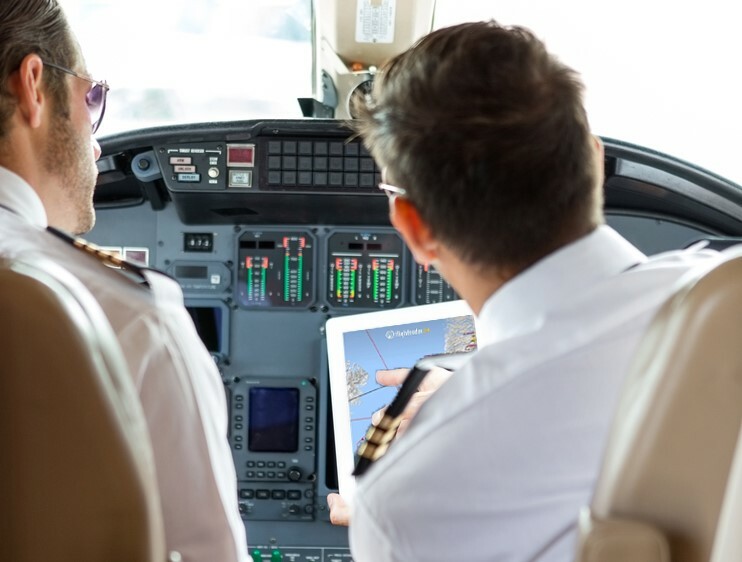 Pilots can even point their mobile device at a plane on the tarmac to find out what type of aircraft it is and where it’s going, or bring up live arrival/departure boards and weather conditions for airports across the world. CloudAhoy is a great app for flight instruction and post-flight de-briefing. When the app is open, it will track all the details of your flight (location, altitude and speed), before creating an easy-to-read flight log. Pilots can then review their flight in real-time using Google Earth, or an aviation chart. Foreflight Mobile is a revolutionary iPad app that covers both pre-flight and in-flight processes. Many pilots have completely replaced their paper charts, and even portable GPS systems, due to this app. The app features moving maps, approach charts, terrain awareness, weather graphics, weight/balance info and much more. Electronic logbooks are nothing new, but LogTen Pro X has really set the benchmark. It’s one of the most powerful logbook apps on the market, and can completely replace paper logbooks from a legal standpoint. This self-contained iPad app syncs automatically via The Cloud. It keeps track of flight times, lets pilots view currency requirements and limits at a glance, and automates a range of scheduling processes. The E6B Aviation Calculator is an ideal app for solving pre- and in-flight navigation problems. It tracks the flight in a similar way to CloudAhoy (but also records fuel consumption), and provides extensive real-time global weather reports and unit conversion capabilities. It’s also comparatively inexpensive and requires no ongoing subscription costs. The Qref Aircraft Checklists app brings digital versatility to what was once a solely paper-based procedure. The app contains pre-flight checklists (written by Qref) for over 50 widely-used aircraft types, enabling pilots to pull up a relevant document with just a few swipes. With versatility in mind, this app is available for both iPhone and iPad, and gives pilots capacity to customise docs to suit their own needs. SkyDemon brings a new level of convenience to flight planning and in-flight navigation. Pilots can use this app to create, or edit, route plans by simply selecting waypoints, then letting the app calculate everything else. The app also includes aeronautical vector charts with dynamic airspace clipping and a virtual radar that calculates everything from speed and weight, to airspace, terrain and rainfall. However, even with app developers competing to automate additional processes with new technology, an experienced pilot is still the most important part of the equation. At AeroProfessional, we’ve created an extensive pool of talented pilots just waiting to take to the skies. Discover more of the latest trends in aviation and how you can utilise them to optimise your pilot recruitment strategy by calling on AeroProfessional.